Hotlines, support, order services, information retrieval or marketing campaigns are the ideal area of application for 0800 telephone numbers. With 0800 numbers, they are not only accessible under a single phone number, but also benefit from extensive services for the distribution, pre-qualification and rating of calls. 0800-Servicelines signal the highest degree of customer proximity and service orientation. Because by the free contact via 0800 you invite to the dialogue and generate thereby more customer contacts. Alternatively, you can request your own 0800 numbers at the Germany regulator (Bundesnetzagentur). The 0800 Freephone service is free for the caller. You transfer the call charges for your callers to the 0800 number. We would be pleased to provide you with easily recognizable 0800 numbers from our pool within a very short time. Of course we will take over your existing numbers. Our porting service is free of charge. 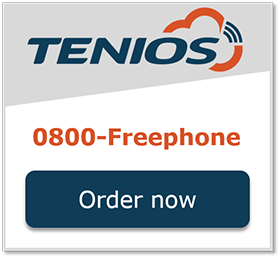 TENIOS provides 0800-freephone services in more than 100 countries worldwide. Your prospective customers and customers need only one phone number for telephone contact. The distribution is based on internal calls. Freephone numbers are not geographically localizable and give your company an international, service-oriented appearance. Moreover, they are usually more easily noticeable (e.g., 0800 55400300). Use the toll-free number to load the dialog. They show customer proximity and service orientation. The call is free for their customers (both from the fixed network as well as from mobile networks). Advanced call forwarding and announcements options are part of value added numbers. Depending on the business case, you can customize the menu for callers. The number is also retained when moving or transferring business since the number is not linked to any fixed network connection. Freephone numbers have been around since the 60s. In Germany, 0800 numbers were introduced in the 90 years (formerly 0130 numbers). The idea of ​​free calling numbers is that callers do not pay any connection fees. The call is free, no matter whether this is from the fixed line or mobile phone. The company pays these fees. For tenios, for example, they are € 0.033 from the fixed network and € 0.135 from mobile communications. The telephone numbers are assigned by the Federal Network Agency and will be charged an allocation fee of € 25 once. Alternatively, tenios provides its customers with 0800 numbers. Freephone or Tollfree numbers are virtual numbers. The incoming calls are forwarded to existing telephone lines or via SIP to the employees or call centers of the company. Forwarding of this number is carried out by the supplier, e.g. tenios. Customers can take advantage of a variety of routing options and supplementary lines (e.g., multiple destination ports, queues, announcement services, reporting, voice messages). These services are included in the package price. The principle of freephone numbers exists worldwide. You can switch international freephone numbers via tenios without local presence or your own technique. The 0800 calls are forwarded from the desired country to their connections.